Data tables enable you to enter a series of possible values that Excel 2016 then plugs into a single formula. A one-variable data table substitutes a series of possible values for a single input value in a formula. Sales projection spreadsheet with a column of possible growth percentages to plug into a one-variable data table. As you can see in this figure, a column of possible growth rates ranging from 1% all the way to 5.0% have been entered down column B in the range B8:B24. Sales projection spreadsheet after creating the one-variable data table in the range C8:C24. Copy the original formula entered in cell B5 into cell C7 by typing = (equal to) and then clicking cell B5 to create the formula =Projected_Sales_2017. The copy of the original formula (to substitute the series of different growth rates in B8:B24 into) is now the column heading for the one-variable data table. Select the cell range B7:C24. The range of the data table includes the formula along with the various growth rates. Click Data→What-If Analysis→Data Table on the Ribbon. Excel opens the Data Table dialog box. Click the Column Input Cell text box in the Data Table dialog box and then click cell B3, the Growth_2017 cell with the original percentage, in the worksheet. 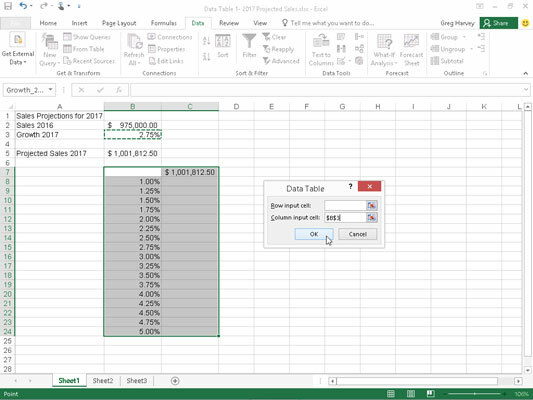 Excel inserts the absolute cell address, $B$3, into the Column Input Cell text box. Click OK to close the Data Table dialog box. As soon as you click OK, Excel creates the data table in the range C8:C24 by entering a formula using its TABLE function into this range. Each copy of this formula in the data table uses the growth rate percentage in the same row in column B to determine the possible outcome. Click cell C7, then click the Format Painter command button in the Clipboard group on the Home tab and drag through the cell range C8:C24. Excel copies the Accounting number format to the range of possible outcomes calculated by this data table. 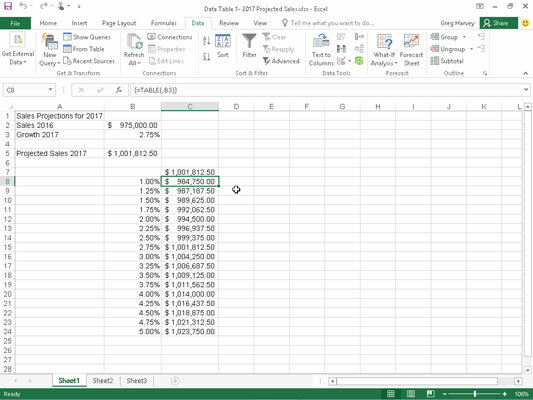 If you modify any growth-rate percentages in the cell range B8:B24, Excel immediately updates the associated projected sales result in the data table. To prevent Excel from updating the data table until you click the Calculate Now (F9) or Calculate Sheet command button (Shift+F9) on the Formulas tab, click the Calculation Options button on the Formulas tab and then click the Automatic Except for Data Tables option (Alt+MXE). If you try to delete any single TABLE formula in the cell range C8:C24, Excel displays a Can’t Change Part of a Data Table alert. You must select the entire range of formulas (C8:C24 in this case) before you press Delete or click the Clear or Delete button on the Home tab.